Black rhinoceros "Kenya" which was trained to perform with the asian elephant Birka. 1984 when it transferred to Columbus Zoo. 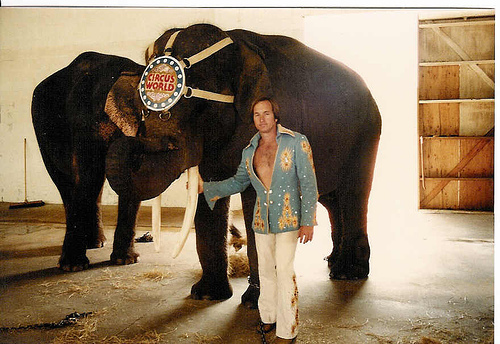 Roman Schmitt was born in New Orleans, Louisiana, on December 15 1951, as son to the world famous german elephant trainer Hugo Schmitt who worked as chief elephant trainer at Ringling Bros. Barnum & Baileys Circus (RBBB). Roman Schmitt was educated in Florida, where the Ringling circus had its winter quarters, and, while serving as a catcher for the Riverview High School baseball team, was signed up by the New York Mets, playing in the team's "farm" system, which trained young players, for two years. After that, Schmitt returned to the circus and worked with his father, learning about the training of elephants with the touring circus. 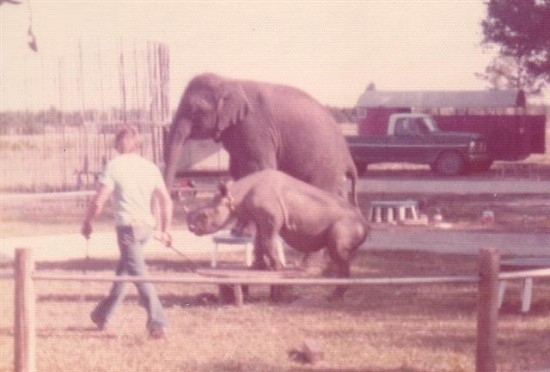 He later went on to work at the Circus World theme park in Haines City near Orlando, Florida, where he presented a group of young elephants and started the park's breeding plan. In 1983, Schmitt suffered a near-fatal accident when he was gored by by the elephant bull Toomai. As he was walking him from the barn to the paddock, Roman was gored through the leg and got life threatening wounds, but recovered and went on to train some unusual circus acts, one of which involved a tiger riding on the back of an elephant. In another turn developed by Schmitt, "Kenya" - which he claimed was the world's first trained black rhinoceros - appeared alongside the elephant "Birka". After leaving Ringling's circus, Schmitt went to work at the Busch Gardens animal theme park in Tampa, Florida, and was instrumental in developing a successful elephant breeding programme there, of which the park's management was justly proud. Megan Schmitt from Bradenton, Florida.